(Nanowerk News) Most lenses are, by definition, curved. After all, they are named for their resemblance to lentils, and a glass lens made flat is just a window with no special powers. With this new invention described today in Science ("Multiwavelength achromatic metasurfaces by dispersive phase compensation"), the Harvard research team has overcome an inherent drawback of a wafer-thin lens: light at different wavelengths (i.e., colors) responds to the surface very differently. Until now, this phenomenon has prevented planar optics from being used with broadband light. Now, instead of treating all wavelengths equally, the researchers have devised a flat lens with antennas that compensate for the wavelength differences and produce a consistent effect--for example, deflecting three beams of different colors by the same angle, or focusing those colors on a single spot. "What this now means is that complicated effects like color correction, which in a conventional optical system would require light to pass through several thick lenses in sequence, can be achieved in one extremely thin, miniaturized device," said principal investigator Federico Capasso, the Robert L. Wallace Professor of Applied Physics and Vinton Hayes Senior Research Fellow in Electrical Engineering at Harvard SEAS. Bernard Kress, Principal Optical Architect at Google [X], who was not involved in the research, hailed the advance: "Google [X], and especially the Google Glass group, is relying heavily on state-of-the-art optical technologies to develop products that have higher functionalities, are easier to mass produce, have a smaller footprint, and are lighter, without compromising efficiency," he said. "Last year, we challenged Professor Capasso's group to work towards a goal which was until now unreachable by flat optics. While there are many ways to design achromatic optics, there was until now no solution to implement a dispersionless flat optical element which at the same time had uniform efficiency and the same diffraction angle for three separate wavelengths. We are very happy that Professor Capasso did accept the challenge, and also were very surprised to learn that his group actually solved that challenge within one year." 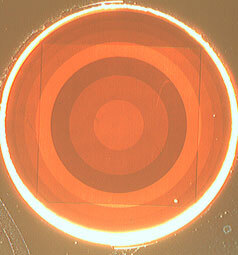 The new lens, dubbed an "achromatic metasurface," dramatically improves on the flat lens Capasso's research group demonstrated in 2012. That prototype, the first of its kind, corrected for some of the aberrations of conventional lenses but suffered from the limitation of only focusing light of a single wavelength, and its focusing efficiency was small. The new model uses a dielectric material rather than a metal for the nanoantennas, a change which greatly improves its efficiency and, combined with a new design approach, enables operation over a broad range of wavelengths. Most significantly, the new design enables the creation of two different flat optical devices. The first, instead of sending different colors in different directions like a conventional grating, deflects three wavelengths of light by exactly the same angle. In the second device, the three wavelengths can all be focused at the same point. A flat lens can thus create a color image--focusing for example red, green, and blue, the primary colors used in most digital displays. The team's computational simulations also suggest that a similar architecture can be used to create a lens that collimates many different wavelengths, not just three. "This is a major step forward in establishing a planar optical technology with a small footprint which overcomes the limitations of standard flat optics, known as diffractive optics," said Capasso. "It also opens the door to new functionalities because of the enormous design space made possible by metasurfaces." "This is an elegant and groundbreaking accomplishment," said Nader Engheta, H. Nedwill Ramsey Professor at the University of Pennsylvania, who was not involved in the research. "The planar optical structures designed and demonstrated by Professor Capasso's group have much less volume than their conventional bulky counterparts and at the same time their chromatic aberration has been suppressed. This is an important development that will undoubtedly lead to other exciting innovations in the field of flat photonics." "Our previous work on the metallic flat lens produced a great excitement in regard to the possibility of achieving high numerical aperture and spherical aberration-free focusing with a very compact design. By demonstrating achromatic lenses we have now made a major step forward towards widespread future application of flat optics that will certainly attract the interest of the industry," said lead author Francesco Aieta, now employed by Hewlett Packard, who conducted the research at Harvard SEAS.